I don't understand that either. As a wild guess, I tried a bunch of different gtk themes in case there is something broken there; no changes. How large in inches is the size of the logout popup on your screen? It's the 543x275 pixels as specified by the yad script; approximately 7.5 x 4 inches (gimp print size). Would this dialog normally need to be maximised or minimised? I fact, would it need a title either? The old one did not and I think plain Jane is quite nice.. I quite like plain Jane! to match line #3 so that the class name will be "vs-session-manager"
@PackRat Someone with a bit of Gimp'ing talent can create an empty transparent canvas of around 550 x 225 and put the VSIDO orb on top of it and merge the layers. The resulting image then can be manipulated into YAD window. ^ Agreed. I like it plain too. man yad | grep "image"
As I already said in one of my previous posts yad always allign image on the left side of dialog. Is that a typo on line 4? RatMan as I keep repeating in this forum you are the man! That is a typo! Thanks for the pointer! The titlebar is necessary as it provides the 'cancel' option via the close button. And perhaps you didn't try the script otherwise you would have noticed the window is fixed-size. It wouldn't maximize. In a good window manager theme the maximize button would remain hidden or disabled. What is the new feature? "Screen Lock" is the new feature. It allows you to quickly lock your session when need be. The script will prefer the "Screen Lock" helper application in the above order. If none of the above is installed the "Screen Lock" button won't appear in the dialog menu. 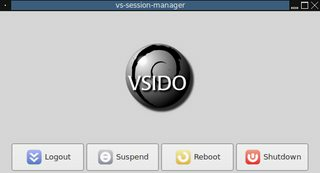 I have decided to rename the script to "vs-session-manager" to avoid any conflict with the current "vsido-exit" script. Download the attached vs-session-manager.tar.gz archive. Extract its contents into a directory. Open that directory in terminal emulator. You can manually add an entry for "vs-session-manager" in Fluxbox menu. It will autometically show as "vs-session-manager" in the main menu of any freedesktop.org compliant DE or WM.